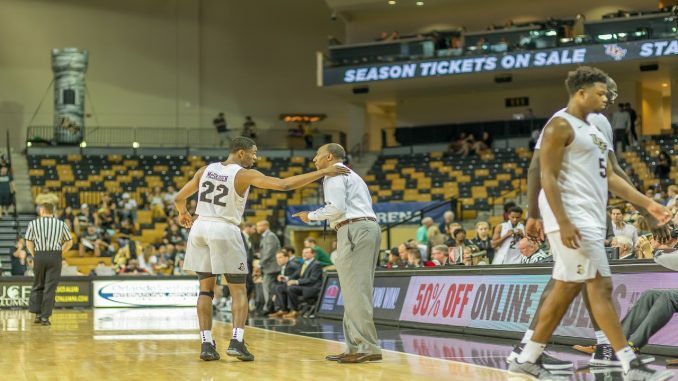 The UCF Knights used a well-rounded attack, along with a big second half to beat the Southern University Jaguars 76-60 at home Saturday afternoon. The Knights (6-3) fell behind in the early stages of the game after another slow start on offense that saw them only score four points in the first five minutes. But UCF was able to pick it up a bit, and went into halftime with a 34-32 lead. UCF was able to separate in the second half thanks to strong offensive performances from junior center Tacko Fall and redshirt senior forward A.J. Davis, who each had 10 points in the second half. The Knights pushed the lead to double digits with 14:01 left in the game and were in control for the remainder of the game. The Knights struggled from behind the three-point line, shooting 8-24, but shot 53 percent from the field overall. They also outrebounded the Jaguars 38-25. Fall led the team in scoring with 18 points to go along with nine rebounds, followed by Davis who had another stellar all-around game with 12 points, a team-high seven assists, and eight rebounds. Senior guard Djordjije Mumin had a career-high for the second game in a row, scoring 12 points on 4-7 shooting from beyond the arc. UCF did not allow a Jaguar player to score more than 13, but Southern finished with five players in double digit scoring. UCF’s next game is Tuesday against Southeastern Louisiana at home.